Editor's Note: This is the second in a series of articles about Eagle Claw kung fu. The first, Inside Eagle Claw, provides a summary overview and historical prospective on this art. This article focuses on the how to make the Eagle Claw grip, its signature technique. The main technique of the Eagle Claw style is, of course, the claw. When applied properly, it enables the practitioner to seize and control an opponent through pain and/or structural manipulation. This is useful when the goal is to cause minimal physical damage. But it can also set up a throw, a strike or other technique. The finger tips can also directly attack various pressure points, move a muscle or ligament to do so, or to effect the body's blood or energy (chi) circulatory system. The inside of fingers or thumb digits can also activate sensitive points in the process of twisting, pressing or pulling. The Eagle Claw hand is made by bending the four fingers and thumb inward toward the palm, which allows the fingers to grab, or lock, the pressure points. The hand, fingers and wrist must be strong to get the full benefit of the claw. The claw is used for breaking bones, tearing muscles, shutting off the air flow, blood flow and nerve flow. The claw is always made by first opening the hand with four fingers together and the thumb out straight to the side. As you do the claw, at the last instant snap the fingers and thumb into the claw position. Do not make the claw before. 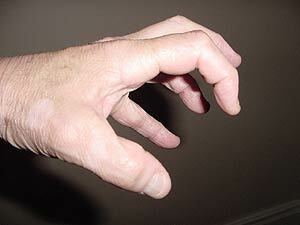 Even when your hand moves from one type of claw to another, the hand must open and then close again into the claw. When grabbing an arm, for example, notice how the curled fingers of top hand grip and dig into painful (lung and heart meridian) points just above the elbow. 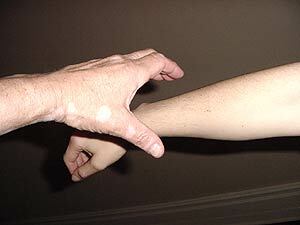 The lower hand grips and digs into sensitive (lung and small intestine meridian) points on the underside of the wrist. Together these grips produce intense pain and create a tingling sensation along the arm all the way to tips of several fingers. This is very different from the way most people grab by using the pads of their finger joints that wrap around their target like a cloth is wrapped around a pipe. The proper application the Eagle Claw requires the finger tips and the thumb tip to dig into the area in question like a clamp. In one example of its use, the Eagle Claw slides down the arm to clamp into place on the wrist. In the hands of an experienced adept, intense pain is the result. Without the correct training, you can only approximate the Eagle Claw's effectiveness. Take an Eagle Claw technique without the full Claw, and you severely diminish its effectiveness. While subsidiary exercises are utilized to develop finger strength, the main tool is the correct use of the Eagle Claw Kuen (forms) practiced over and over for years with each claw being done correctly. The fingers tighten into position and learn how to direct the jing (energy) of the claw into the correct hand position. To say that form study is worthless simply is not true for the Eagle Claw student. If anything, correct training under the direction of a Master Eagle Claw Instructor is the only way to insure that these techniques are developed correctly. Self study from books and video tapes (really designed for subsidiary support for the Eagle Claw student) will not ensure that the techniques will eventually become effective. 1) Open the hand with the fingers straight out and together with the thumb stretched out straight to the side. 2) Bend the four fingers in to make a half fist. 3) The space between the palm and the four fingers should be large enough for the index finger to fit inside. 4) Bend the thumb inward toward the middle finger. 5) The thumb should be two fingers in width away from the middle finger. 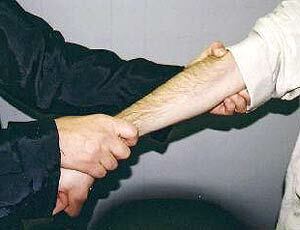 You grab with the finger tips and grip down rather than wrapping around a wrist or other body part. For me it's an attempt to use all four fingers, but when I'm on the receiving end of Ernie Rothrock (my teacher), it feels like his middle finger and thumb are doing all the work (and the other fingers perhaps pressing inward to provide more stability to the middle finger) and feels like needles inserted into my arm. Of course decades of work on the grip, the subsidiary exercises and the forming of the claws tightly every time in every form make a vast difference. As mentioned above practicing Eagle Claw forms is the primary method of building a strong, finger piercing grip. But there are also other methods. Students may practice gripping their partner's arms and segments in two man drills. In modern times squeezing a rubber ball or other spring type exercise hand grips are also used. In olden days students twisted bamboo stocks to develop both fingers, wrists and arms. In Okinawa, karate students often spread their fingers to grip the round rim of clay pot filled with sand or other heavy substances and swung them around to develop their finger strength. One exercise often used to develop finger strength is to do finger tip pushups starting at first by leaning in towards a wall. Pushups should be done with the fingers in an Eagle Claw position (bent) and on the very tip of the fingers. Gradually the angle can be increased as the fingers get stronger until eventually these type finger point pushups can be done from the floor. The study of human anatomy and Traditional Chinese Medicine is helpful in the effective use of Eagle Claw. Through this knowledge specific body points (in conjunction with TCM's theory of energy flow and circulation) can be pressed, moved or hit to create maximum pain, effect control, or cause weakness, loss of breath or unconsciousness, even death. The practice of Eagle Claw forms and two man exercises will also teach the location of many of these points.